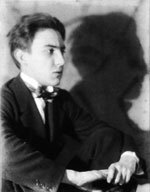 The young novelist Raymond Radiguet (1903–1923) was a post-war literary phenomenon, in terms of his literary precocity a 1920s equivalent (although far nicer) of Verlaine’s lover-nemesis Arthur Rimbaud. His two novels Le diable au corps (1923) and the posthumously published Le bal du comte d’Orgel are stylistic marvels for a writer only just out of his teens. Someone remarked, maliciously, that the bisexual Radiguet knew not only how to use his pen, but his pencil as well. There is no doubt that his liaison with Jean Cocteau advanced his career and his literary position to that of a cult.